When it comes to collections, predictive dialers aren’t getting the job done. At $4-$7 per contact, they’re expensive and ineffective—not to mention that 93% of consumers prefer to be contacted through email and text. Try our savings calculator to see how digital contact strategies outperform predictive dialers, lower costs and improve cure rates with a near-immediate ROI. Case in point: Switching to an integrated voice, email and text outbound collections solution from Nuance saved a large U.S. credit card servicer $2.8 million annually, required 37% less agents and increased payments by 19%. 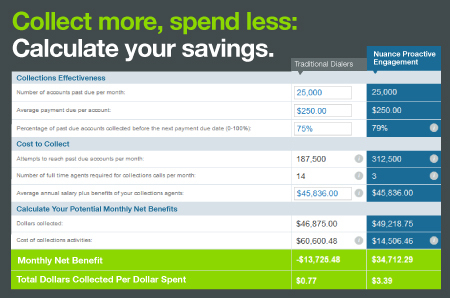 Quantify why now is the time to modernize your collections strategy.